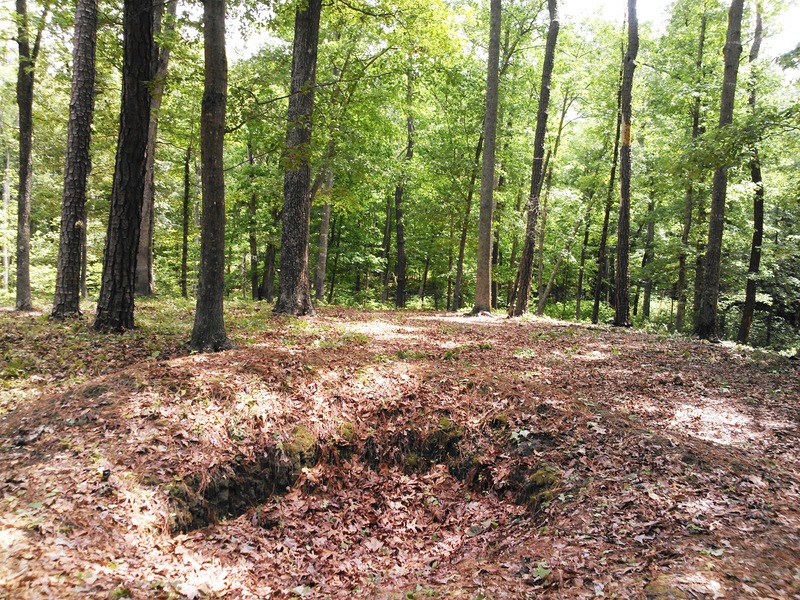 The spring rainfall has covered the central Virginia forests with a lush vegetation that unfortunately obscures many of the physical features that define a battlefield. In attempt to restore some of these viewsheds, I undertook a recent project to clear some of the advanced rifle pits in front of the earthworks occupied by Lieutenant General A.P. Hill’s Third Corps of the Army of Northern Virginia during the Petersburg campaign. Historic landscape restoration looks better on the resume than using a weed-whacker, right? Major General Cadmus M. Wilcox’s division received the important assignment of protecting the line as it extended southwest from the city of Petersburg. The Boydton Plank Road and South Side Railroad, the final two arteries feeding Petersburg, lay to their rear. The Union Sixth Corps stared them down from a mile away, safely tucked behind even more formidable fortifications. 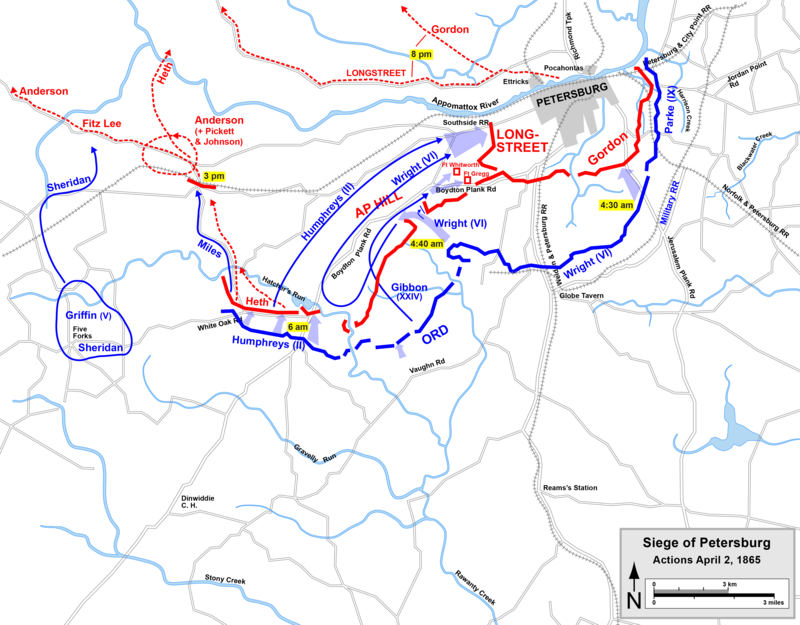 In late March 1865, Federal cavalry led by Major General Philip H. Sheridan joined infantry from the Army of the Potomac and Army of the James in a grand flanking movement to threaten the supply lines far from their hub in the Cockade City. Wilcox shifted portions of his command further down in reaction, leaving a threadbare force in the trenches. Major General Horatio G. Wright, who commanded the Sixth Corps opposite Wilcox, still did not view an order to charge with much optimism, commenting: “The works in front of the chosen point of attack were known to be an extraordinary strong line of rifle-pits, with deep ditches and high relief, preceded by one or two lines of abatis… at every few hundred yards of the line were forts or batteries well supplied with artillery. These lines might well have been looked upon by the enemy as impregnable, and nothing but the most resolute bravery could have overcome them.” Wright’s concern had merit. The Confederates had spent the entire winter transforming the ground in front of them into a slaughter field with potential to rival those of Fredericksburg and Cold Harbor, should Wilcox have ample time and resources to commit them to a particular section. 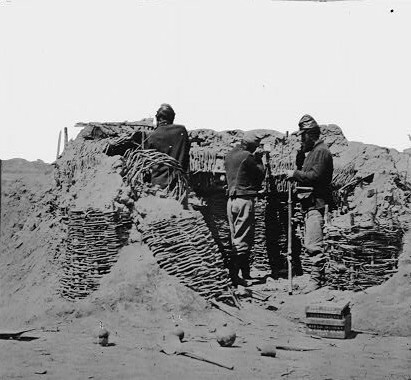 Appearance of the Union and Rebel lines at the Front, from the Parapet of Fort Fisher, Mar. 28. Library of Congress. The two double lines were close. When quiet, we would swap newspapers, tobacco for coffee, with the enemy. It was a very simple process. A Yankee out on the picket line would shake a paper or bundle of coffee and holler at us as to what he had to exchange with us and he would place it on a stump or some elevated place, and go off; then we would go and get it and leave our package for the party to come for. I never knew or heard of either party cheating. The battalions charged and drove their spike head squarely through the Federal lines, capturing half a dozen rifle pits with their occupants. When the battalions had moved half their length through the gap, the right battalion faced to the right, the left battalion to the left, and throwing forward their wings so as to form a sack, swept the lines for nearly a mile on either side, capturing a large number of prisoners with all the supplies needed… The success of the expedition was promptly reported to division headquarters, and approved, with generous commendations by Gen. Wilcox. I managed to get into an old pit that lay, perhaps as much as 80 yards in advance of our present line, where we got several fair shots. We kept our position till about dark. Indeed, after being discovered there, it was too dangerous to attempt to leave it. As the slightest exposure of a man was certain to call forth a number of shots, some of the boys concluded to try the time-honored dodge of holding up a dummy. So they tied a coat to a stick or ramrod, and placing a hat on it, poked it up cautiously. Pop, went the rifles! Dummy was dropped, and a shout went up from the enemy. One more “rebel” killed! After a little Mr. Dummy looked up again, and again the rifles blazed away. The trick was played for some time before they found it out. And even then we could sometimes fool them by moving the dummy along as though it were a man walking. Despite their success in small unit raids and merriment had at the expense of their counterparts, the pickets in McGowan’s brigade had their hand forced by failures at the start of the 1865 spring campaign at Fort Stedman and Five Forks. After recapturing Stedman on the eastern side of Petersburg after slight setback on March 25, the Union army attacked all along the western front, driving the Confederates back to new rifle pits now only two or three hundred yards in advance of the main line. 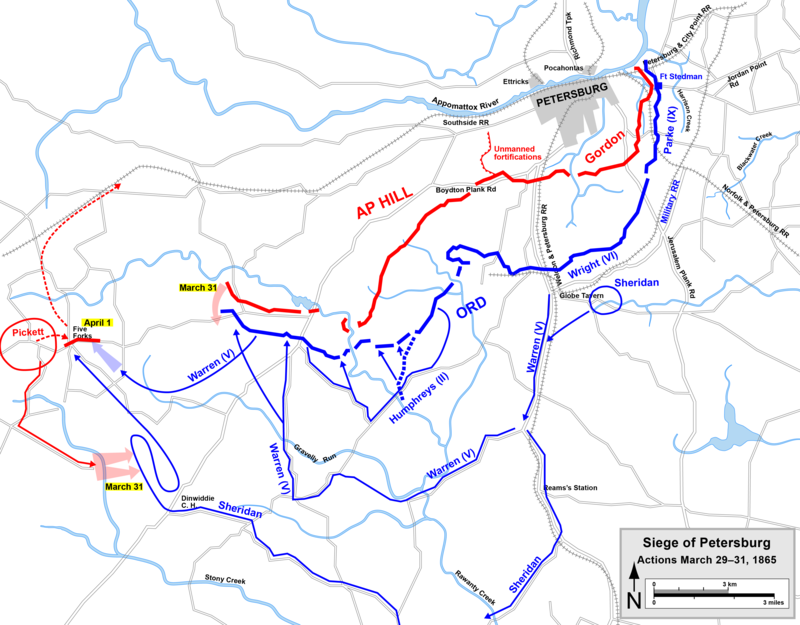 The Fifth Corps joined Sheridan’s cavalry on April 1 in seizing the important crossroads at Five Forks that opened the South Side Railroad to direct capture. We were not engaged during the day [April 1] but the pickets were hotly engaged at times and we could hear heavy firing in the direction of Petersburg and on our right front. The picket firing was rapid and continuous through the night. There was no sleep for any of us. The roar of cannon and small arms in the direction of Petersburg was terrific and told us too plainly that the end was drawing near. I could hear distinctly the enemy in my front preparing for the charge, although they had not begun to advance, when suddenly to my right, perhaps a mile below, our skirmish line began a rapid firing which came steadily up the line until our men behind me caught the infection and began pouring a fusillade into the woods behind me. I crawled on my hands and knees back to the pits, while bullets hissed above me too uncomfortably close to be at all pleasant or assuring. How I escaped I could never tell, and I gave my excited comrades a piece of my mind in not very complimentary terms. I can well recall the severe fighting we had that night as attack after attack was made. I remember that the ramrod of my gun was hung in my gun. Young Cauthern was in the same pit with me. I could not get the ramrod out of my gun. He suggested that he would load his gun and I would do the shooting. He was glad to do this as he could lie down in the pit. He fought this way some time–an hour or more. I was fearful that my gun would burst if I attempted to shoot with the ramrod hung in the barrel but when the enemy came again, I reached my arm out as far as I could reach it and pulled the trigger and shot the ramrod at them. Of course, I had to throw the gun away but soon a gun of a dead Yankee came to my rescue and I used this until I turned it over to them at Appomattox… I remember looking to my right about daybreak and saw the men fighting with the butts of their guns. Even with five-to-one odds in their favor, attempts to overwhelm the Confederates in a firefight would stall the Union assault and buy time for reinforcements to plug gaps in the line. Reliance on the bayonet and speed turned McGowan’s rifle pits into a mere speed bump as the Sixth Corps assault columns steamrolled their way to the Boydton Plank Road and South Side Railroad. The South Carolina soldiers spent six months of the war on this front. In exactly one weeks’ time those remaining would be surrendering at Appomattox. Wright, Horatio G. April 22, 1865 Report. The War of the Rebellion: A Compilation of the Official Records of the Union and Confederate Armies, Volume 46, Part 1. Washington, DC: Government Printing Officer, 1894, p. 903. Caldwell, J.F.J. The History of a Brigade of South Carolinians First Known as “Gregg’s” and Subsequently as “McGowan’s Brigade.” Dayton, OH: Morningside Press, 1992, p. 253. Miller, William J. “My Experience as a Soldier in the Confederate Army.” Winthrop University Archives. Dunlop, W.S. Lee’s Sharpshooters; or, The Forefront of Battle. Dayton, OH: Morningside Press, 1988, p. 226-227. Benson, Susan Williams, ed. Berry Benson’s Civil War Book: Memoirs of a Confederate Scout and Sharpshooter. Athens: The University of Georgia Press, 1992, 178-179. Matteson, J.W. “April 2nd. 1865-95.” The Medium (Abbeville, SC), April 2, 1896. Kimbrough, J.S. “From Petersburg to Hart’s Island Prison.” Confederate Veteran, Volume 22. 1914, p. 498-499. This entry was posted in Battlefields & Historic Places, Campaigns, Emerging Civil War, Sieges and tagged Ambrose Powell Hill, Cadmus Wilcox, earthworks, Horatio G. Wright, Samuel McGowan, Siege of Petersburg, Sixth Corps. Bookmark the permalink.